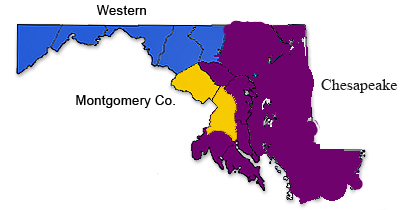 GFWC Maryland Federation of Women's Clubs, Inc.
We are divided into three districts: Baltimore, Eastern Shore, Montgomery County, Southern and Western. Click on a district for more information. GFWC Junior Woman's Civic Club of Cumberland, Inc.
GFWC Civic Club of Oakland, Maryland, Inc.
GFWC Woman's Club of Westminster, Inc. The GFWC Junior Woman's Club of Westminster, Inc. The Woman's Club of Cecil County, Inc.
GFWC Wicomico Woman's Club, Inc. The Woman's Club of Glyndon, Inc. The Joppatowne Woman's Club, Inc. 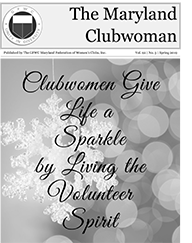 The Woman's Club of Perry Hall, Inc.
GFWC Woman's Club of Linthicum Heights, Inc.
GFWC The Woman's Club of Bethesda, Inc.
GFWC The Woman's Club of Chevy Chase, MD, Inc.
GFWC Junior Woman's Club of Chevy Chase, MD, Inc.
GFWC Silver Spring Woman's Club, Inc.
University Park Woman's Club, Inc. The Montgomery County Federation works with four other organizations to support the Montgomery County Thrift Shop. MCFWC donates time every Thursday and alternating Fridays. Donations of usable household items and clothing in good condition are accepted Mon, Wed, Thurs, Fri and Sat. Tuesday is consignment day for the following items: lamps, antiques, bric-a-brac, mirrors, small furniture, pictures, linens, jewelry, china, silverware and glassware.